The Apollo (Parnassius apollo) has been chosen Butterfly of the Year 2017 by the ZERYNTHIA Association with more than 50% of the votes of the public and the specialists. This diurnal butterfly, associated to mountain systems, is threatened and suffers setbacks in its populations due to several factors, especially the climate change. ZERYNTHIA responds to the distress call of the Apollo with the organization of outings, activities and informative material to observe it and make it known, and in this way promote its conservation. Apollo (Parnassius apollo) is the Butterfly of the Year. Author: ZERYNTHIA. The Parnassius apollo, commonly known as Apollo, is the Butterfly of the Year 2017. The initiative, created by the Spanish Association for the Conservation of Butterflies and its Environment –ZERYNTHIA-, had 700 participants (public and specialists). Among three more contestants –the whitish sulfur (Euchloe bazae), the ocellate bog fritillary (Boloria eunomia) and the large blue (Phengaris arion)–, the Apollo won more than 50% of the votes. The Apollo butterfly is one of the largest and most beautiful Spanish Lepidoptera. Therefore, it is a charismatic and attractive species that every naturalist would like to observe at least in one occasion. It is extended in a large part of the Palearctic, and in the Iberian Peninsula its populations are fragmented in different zones: the Pyrenees, the Cantabrian Mountains, the northern Iberian System (subespecie pyrenaicus), the southern Iberian System (subspecies hispanicus), the Central System (subspecies escalerae) and the Baetic System –Sierra Nevada and Sierras de los Filabres, Gádor and María– (subspecies nevadensis). Historically, up to twenty subspecies of this butterfly have been described, but only the four mentioned above are considered valid at present. However, the scientific community is waiting to have more solid results based on its genetics. As we have just seen, in Spain the Apollo butterfly is associated with mountain systems. Its habitat is located in alpine and subalpine areas, at altitudes between 400 and 2,800 meters depending on the region. It accepts lower heights in the north and requires places with a higher elevation in the south. Photo and brief summary of the candidate Apollo offered by ZERYNTHIA for the vote of the Butterfly of the Year 2017. On the right, it can be seen its distribution map. Author: ZERYNTHIA. For its development, it needs low temperatures and regular snowfall in winter. Adults are active mainly between June and August, time when the eggs are mated and deposited. It passes the autumn and winter as caterpillar in a first stage of development. Later, the caterpillars feed on plants of the genus Sedum. Depending on the zones, it uses different species, such as S. album or S. amplexicaule. At the end of its development, it produces a light cocoon of silk which is placed on the ground, and on its inside is formed the chrysalis. Due to its dependence on a cold weather, climate change means an important threat to this Lepidoptera and is a factor that could explain the loss of some of its populations nowadays. Likewise, the construction of infrastructures that alter the quality of their habitat, such as the ski resorts, are a strong pressure for this species. The application of pesticides for forest use is another of its threats. According to the International Union for Conservation of Nature (IUCN), it has become n in Romania, Latvia and Lithuania. In the rest of Europe and also in Spain, their populations have decreased by around a 30% in recent decades. It is important to notice its local extinction in Gádor (Almería) and in several localities of the Basque Country, among other places. It has recently been rediscovered in Sierra de los Filabres (Almeria), where it was also believed to be extinct. However, it still has populations in an excellent state of conservation. Some examples are those in the Pyrenees, in the Picos de Europa or in the Iberian system. It is also a species traditionally threatened by over-harvesting, which is the reason why it was included in the Appendix II of the Convention on International Trade in Endangered Species of Wild Fauna and Flora (CITES). It is also included in the Annex II of the Berne Convention, the Habitats Directive and the List of Wild Species under Special Protection Regime, as well as in the regional catalogs of some Spanish autonomous communities. In fact, it was the first species to be protected in Europe. Video of the butterfly in its natural habitat. Author: ZERYNTHIA. The ZERYNTHIA Association started the initiative Butterfly of the Year in 2016, which consists of choosing a threatened species to focus some of the association’s efforts on its divulgation, study and protection. The first Butterfly of the Year was the Spanish moon moth (Actias isabelae). During the year 2016, numerous activities were carried out to observe the species selected in most of its Iberian populations, something that allowed many nature lovers to have their first contact with a butterfly as emblematic as the graellsia. Also, informative and didactic materials were elaborated to make known their importance, some of them still to be published. The Spanish Association for the Protection of Butterflies and their Environment -ZERYNTHIA- is a group of professionals in entomology and nature lovers, all of them interested in day and night butterflies. Constituted in 2006, this entity’s objectives are the conservation, dissemination and study of Spanish butterflies, their habitats and the threats to their populations. Its name comes from the Spanish festoon (Zerynthia rumina), an endemic species in the Iberian Peninsula, small areas of the north of Morocco and the south of France. It represents all those species that are not legally protected, but that deserve that protection because of its endemic character. Look at the observations of the Apollo that we have in Natusfera and participate sending new ones this summer through the PAPILIO subproject, within the main project Lepidoptera in Spain. 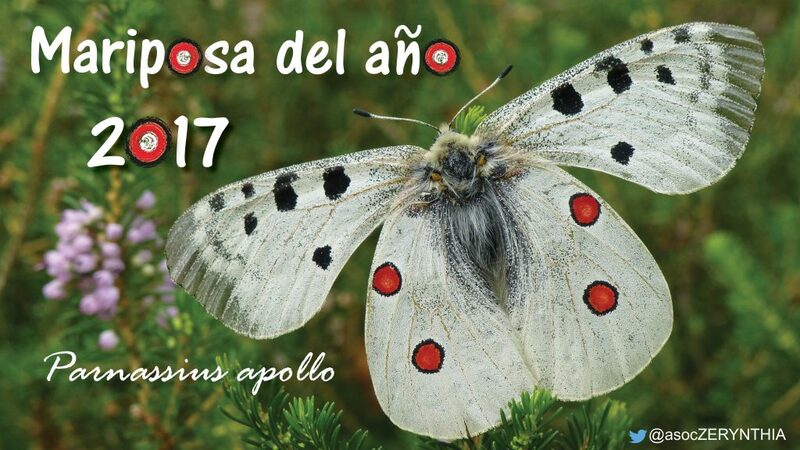 This entry was posted in Biodiversidad and tagged apollo, apolo, Berne convention, Butterflies, butterfly of the year, cambio climático, CITES, climate change, convenio de Berna, directiva Hàbitats, Habitats directive, IUCN, lepidoptera, lepidópteros, mariposa del año, Mariposas, Natusfera, parnassius apollo, UICN, zerynthia. Bookmark the permalink.